It’s back! It took a little while to make its return, but Nine Innings is ready for round two. In this feature we will interview (9 questions of course) a current Cubs player or Cubs prospect for your reading enjoyment. This is a big accomplishment for us as we hope it brings you, the reader, even closer to the team and players you love. 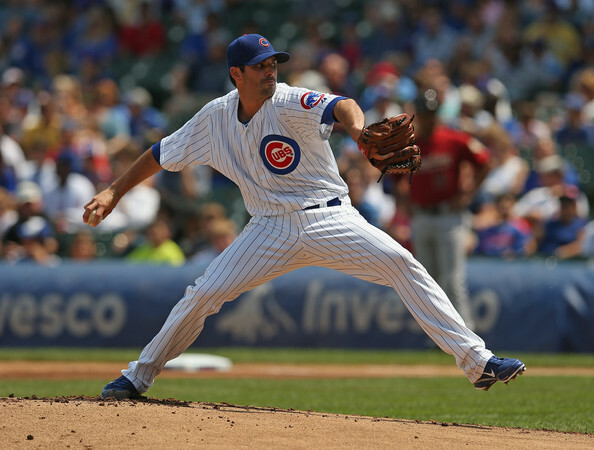 In the second installment of 9 innings, we sit down with Cubs starting pitcher Justin Germano, I hope you enjoy it. BornOn3rd: In your short time in Chicago, how have the fans been with you? Has anything surprised you? Justin: So far the fans have been top-notch. This is a team with a lot of history and tons of loyal fans everywhere we go. It makes it really fun. BornOn3rd: You’ve pitched some out of the bullpen and some in the rotation, how is the preparation different? Justin: Preparation is different because as a starter you know when you’re going to pitch; you have four days to work on what you need to. Out of the pen you never know when you’re going to go, so sometimes you have to get extra work in before the game knowing you may still pitch that night. BornOn3rd: Favorite City to visit when you are on the road, why? You can throw Chicago in this discussion because you haven’t been here too long. Justin: Well, Chicago would definitely be up there if I didn’t play here. So top of my list would be San Diego, because I live there and get to stay at my house and sleep in my own bed! BornOn3rd: You’ve bounced around the Minor Leagues and Major Leagues your whole career, what is the toughest thing about that? Justin: The toughest thing is making new impressions. The older you get and starting over with teams the leash for failure gets shorter and shorter. BornOn3rd: Who is the best hitter you have ever faced, at any level. Justin: The toughest hitter for me would probably be Matt Holliday. He is a very good all around hitter; he hits for average and power, and hits all pitches well. BornOn3rd: What is it like to be only 30 years old and be a “veteran” on this team? Justin: It’s pretty crazy. We have a very young team but tons of talent. We have the chance to be very competitive in the coming years. BornOn3rd: I’ve touched on bouncing around, but you have pitched all over the World. Tell us about that experience, how different is it compared to baseball in the States? Justin: Going overseas was a cool experience. It gave me a chance to see other cultures. On the baseball side of it, it taught me how to attack different kinds of hitters. That has helped me even back in the States. BornOn3rd: What is your best baseball memory? Justin: My best memory hands down would be my perfect game I threw last year in AAA. That’s something all pitchers dream about. I don’t care what level you’re at, to go 27 up and 27 down is a great accomplishment, and one that I will always remember. BornOn3rd: Have you always seen yourself as a pitcher? Feel free to discuss your little league home run record now. Justin: Pitching has always been my passion. I could always hit, from little league all the way through High School. I still feel like I can be a good hitting pitcher too, just have to get enough batting practice in. BornOn3rd: Is there anything that you want Cubs fans to know about you that they can’t already find on the internet? Justin: Hmm, probably the toughest question. I’d say maybe just my hobbies, I enjoy all outdoor activities. I mountain bike in the offseason, and I plan on taking up stand up paddle boarding this year. I have two awesome 90 pound boxers that I love and treat as my kids. Even though I already have a son and another on the way, my big boys are a huge part of my life and couldn’t imagine not having them. An absolute huge thank you to Justin Germano (Follow him on Twitter) for sitting down with me and answering some questions from Milwaukee where the Cubs will try to avoid a sweep today. Justin really is a great guy that gets it, he is always interacting with fans via twitter and has definitely paid his dues to be where he is at. Best of luck to Justin the rest of the year!